So this is the Second part of festive bakes! Apart from cakes decorated in candies and other baked goods ( see my obsession with putting mini food on cake…), I have been required to do fondant work. Let me make this clear I am not a professional when it comes to fondant; in fact if I am being completely candid I am beginner who REALLY dislikes it. Maybe I have a dislike for fondant because it requires skills of a pattern maker or architect. It is funny that did textiles as a major subject in my final year of high school but yet have gone complete in opposite direction. I am thinking the years of ruling up patterns, measuring twice; cut once and the frustration of failed garments have deterred me from EVER picking up a ruler again. OR it could be the fact that I have numerous cake fails when it comes to covering cakes in fondant. While I might dislike measuring; I am pedantic when it comes to the smoothness of cakes whether it is butter cream or sugar art. Some people may think my cakes are flatly iced but I can see all the bumps and lumps on it which have caused the permanent scowl on my face. Along with other “very desirable qualities”, it makes it difficult for me to be happy with my fondant cakes, which is why I do not post them here. However I feel that this one can help a lot of people who have a little boy (or girl!) 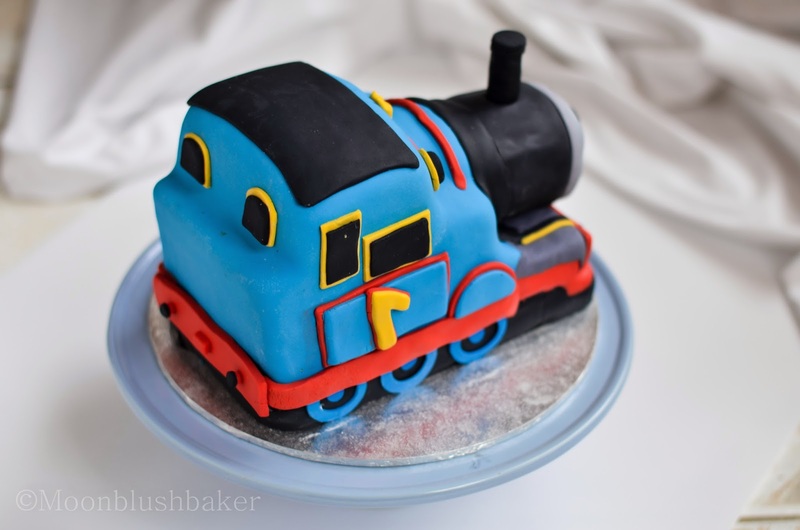 who likes Thomas the tank engine. In Australia there are three cakes EVERY child has to have at one point in their childhood. These are (in no particular order) the swimming pool cake, the princess doll cake and the train cake. All these cakes come from the classic 80’s edition of the Australian Woman’s weekly Birthday cakes and as retro as these cakes are they have stood the test of time. 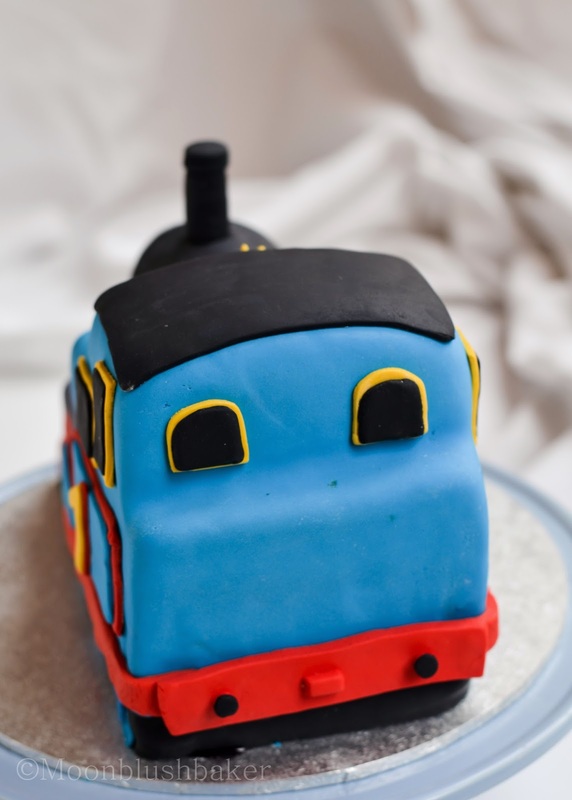 Inspired by the train cake and the little boy’s love of Thomas; I embarked on my quest to make a Thomas the Tank engine driven train cake. The front is completely made of fondant while the back is covered in Swiss butter cream and filled with a mixture of fruit loops, taffy, jelly beans and hard candies. The wheels on the carriages are created with oreos and all addition decorations are hard boiled lollies. The fence holding the treats in is created with half a piece of stretched out caramel chocolate ( know as a curly wurly in Australia). I used a ganache recipe for the crumb coat which is a 3 parts white chocolate to one part cream eg. 300 grams of white choc to 100 ml of cream. 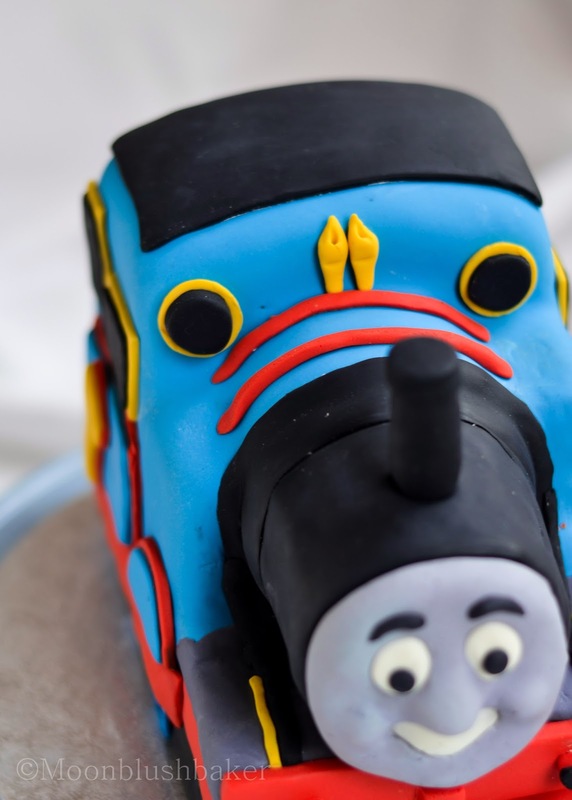 You will need about 1 kg of ganche for all the cake in including the crumb coat for the carriages and about 500grams of blue butter cream for the carriages. To achieve the blue (fondant and butter cream) I used mix of gel food colour by Wilton and Americolour; while the red (fodant only) was already dyed. The cake need to be something quite stable so I used a vanilla butter cake recipe which I include below. 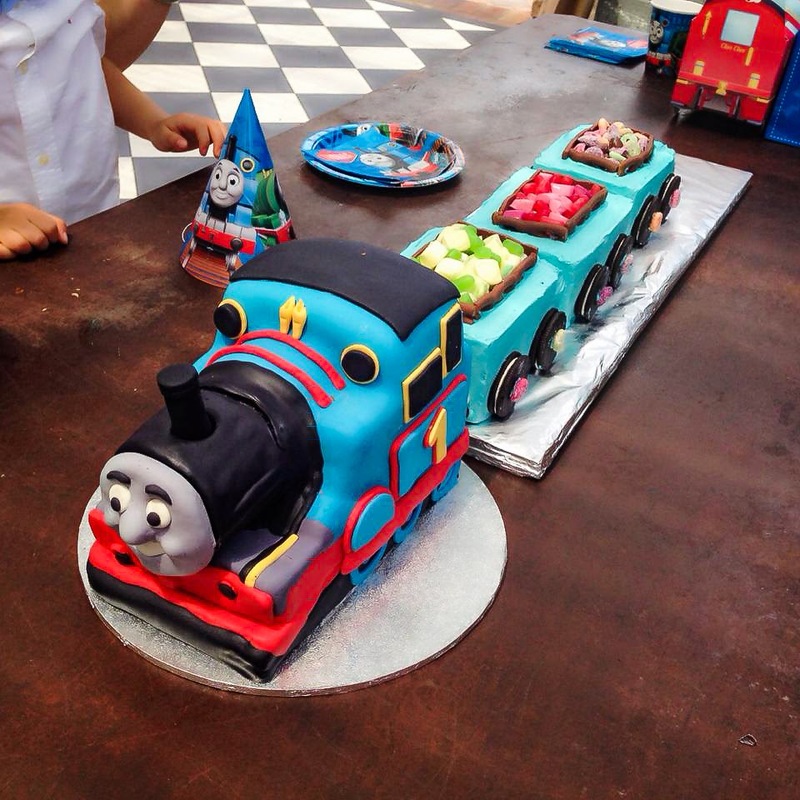 I will list all the resources I that helped me make this cake and the dimensions I used for the train and carriages. 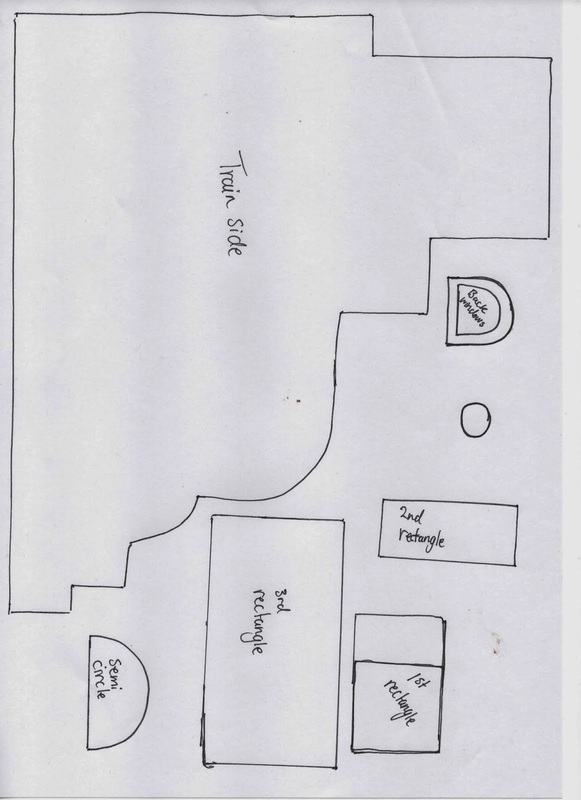 Also I have scanned in the template I used to help me create the shaped Thomas part of the cake ( side and base). I hope you guys can read it; I placed it at the bottom of this post so for those of you who are interest in making a cake this can use it. 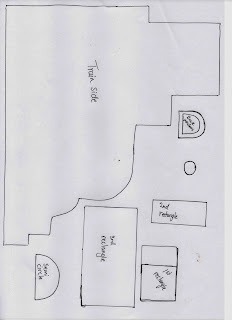 To use in enlarge the picture it so that it fit on to an A4 piece of paper. I was greatly helped by this video and walk through on How to cook that, it actually saved me from a complete melt down. Go to the website below to learn how to shape front of the cake as it explains it a lot better than if I wrote it down in instructions. Also I will not claim the technique of shaping the cake as it belongs to How to cook. You will need to begin this cake at least 4 days in advance; so you can do all the decorations, make the cakes and creams and give time for the cake to set with fondant. I did all the details 7 days in advance so they could dry. 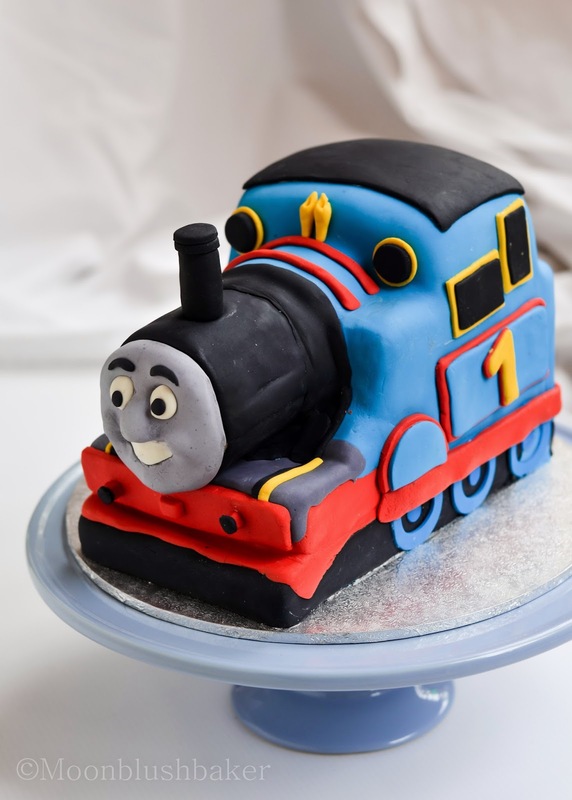 I am sorry I do not have any progress shots but E-mail me or comment if you need any help in your fondant train cake. ANYWAY this a completed photo of the cake taken by the mother; she was so nice to send them to me! Pre heat oven to 160C. Line a greased sheet tray pan (11 inches by 15 inches by 3 inches) with baking paper. Sift flour together in a medium bowl set aside. In a stand mixer cream butter, sugar and vanilla till it is light and fluffy. This should take about 5 minutes. Add eggs beating well in beat each addition. Alternating between flour and milk; fold each into the butter mix. Do this until just combined. Pour in your tin. 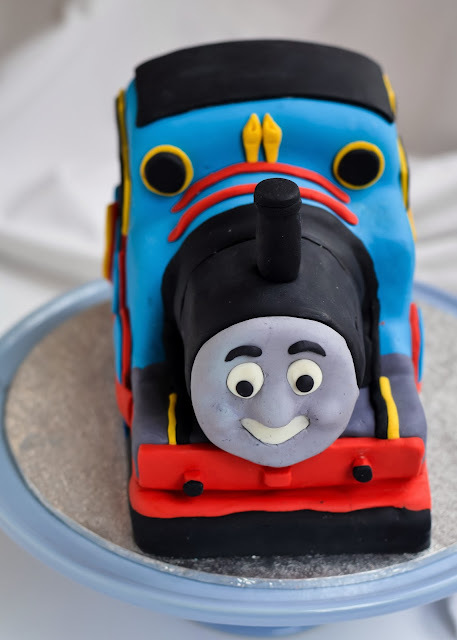 In order to construct Thomas’ face I used about 200 grams of grey fondant, small (<50g) of black and white fondant. The diameter of the face is approx. 7-8 cm which I made using a circle cutter and slightly rounding out the sides. In order to create the raised features I used this tutorial, which gives you a step by step guide with images. 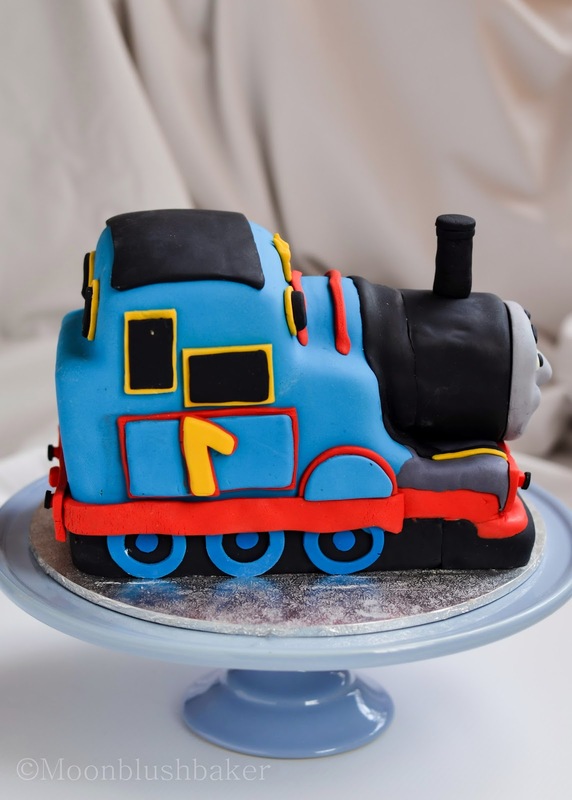 I also used a bit of creative guessing and the help of a picture of Thomas. Dust your surface with corn flour. Roll out you grey to 1cm thick. Using a circle cutter cut a shape in your grey fondant. Using your hands, smooth out the edges to create a shallow dome sphere. Using a butter knife create a fold in the middle lower 2/3rds of the face. This will be the nose. Roll a small ball of fondant and place it inside this fold. By moistening the fondant with Vegetable shortening, join the flap to the base of the face so you are covering the tiny ball in the face. Smooth out the join with the large rounded fondant tool. Create two dents in the top half of the face which will be the eyes. Mark the smile with the small rounded fondant tool below the nose. Using a small amount of fondant shape the smile, paint with sugar syrup and place it in the dent below the nose. Using the small rounded fondant tool smooth out the smile into the face creating the chin. For the cheeks, like the nose create to flaps on each side of the smile. Insert a tiny ball of fondant in each space. Join the seam with your fondant tools and vegetable shortening. Roll out two 5mm circles for the eyes and glue them with sugar syrup to the face. Glue a tiny dot of black for the pupil. Create eyebrows with black fondant using a sharp blade and a flat piece of black fondant. Glue this down as well with sugar syrup. At this point you can create all the details for Thomas such as the wheels, side panels, strips, whistles etc. I have drawn out the panels on the cut out below to help you. However the red and black strips are variable depending on your cake. NOTE; The panels below are for the larger rectangles, to get the smaller ones simple reduce the print size to 75% and print from their. Using the base template cut out 4 x 4cm deep rectangles from your cakes. Sandwich these with ganache. Take the side template and cut around the template to form a rough train shape. Discard cake. While looking from the front, you will need to make a 3cm small cylinder with remaining cake. Cut out semi circles of cake and sandwich with ganache. Attach to the cake with ganache. Cut out a small section of cake below the so you have a place to put another circle of cake. Make a 4cm long cylinder but do not place on cake yet. Ganache this cylinder. Crumb coat the cake in ganache and leave to set for 12 hours. This technique is from how to cook that. Using a strip of black fondant cover the bottom edge of the entire cake. Do the same with a red strip to cover the front section above the black. Cover the level above the red with grey fondant and smooth out. To cover the cake first roll out your blue fondant to large rectangle (about x1.5 size of the cake) about 3mm thick. Drape over the cake smooth out the cake with your hands; using vegetable shortening and corn flour to help it along. Using your hand feel your way around the cake. Cut the blue fondant and join the seams. Attach your cylinder to the front of the cake and cover with black fondant. Smooth it out the best you can to join the black and blue without a noticeable seam. Glue on wheels blue with sugar syrup. Cut another red strip to cover the join at the back of the cake. This will cover the wheels abit that is OK.
Make the stripes, black cover and chimney for Thomas. Attach these with sugar syrup. Attach your details on the cake (e.g windows, numbers, whistle and bumper) with sugar syrup. Finally glue your face on to the cake with fondant glue. Level out the 2 of the slab cakes. Cut out 14cm by 19cm rectangles in this cake. You can use left over cake to make the full rectangles by sandwiching them with ganache. Place two of these rectangles on top of each other and sandwich with ganache. Crumb coat and leave to set in the fridge for one hour. Make blue butter cream. Place your cakes on a turn table lined with baking paper. Ice the cakes with butter cream; creating the sharpest edge possible. Transfer to fridge to harder for 3 hours. Move to a long cake board. Hollow out a small gap in the middle of these rectangles for candy. Make the fence with the long caramel chocolate. Fill with lollies and fruit loops. 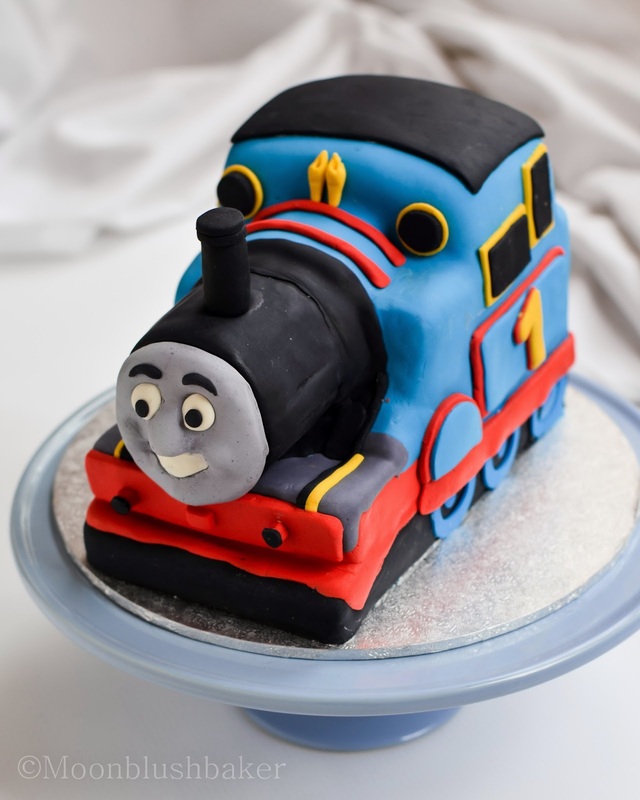 Make lights on carriages with boiled sweets and gently press in 2 Oreos to each side of the cake. SO CUTE!! love it! Happy new year to you and thanks for always providing fab food inspiration! Thank you Trisha! Happy new year to you too. That is just so so sweet!! I’ve never done to that level, very impressive.